There are basically three categories of helmets, including cheap, mid-range and the expensive range. 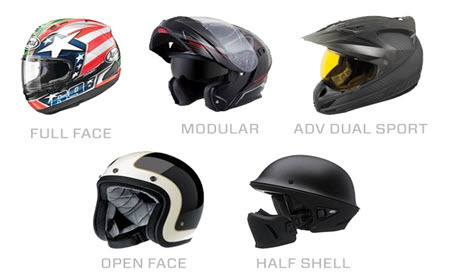 While each of these have their benefits, there are a few things you’d need to consider when buying your first helmet, which isn’t all about going for the most expensive or the best looking, but rather the safety features and the testing the helmet survives. The cheaper helmets are of course the most popular as the cost less and seem to do the same thing, right? Not exactly, especially not when you consider the different shapes and exact sizes that might work best for your head. Firstly, the cheaper helmets don’t really cater to different head shapes as they are mass-produced on the most common shape, which is round. Someone who has an oval head won’t feel comfortable with these helmets, and they won’t get the same level of safety from the helmets during an accident. Cheaper helmets also don’t go through the same testing and aren’t approved, meaning you don’t have any idea just what this helmet might do in case of an accident. When you read up about helmets, you’ll find many cases where it actually just bursts on impact, leaving you without a helmet at all. Therefore, it’s important to choose a helmet that has been tested in multiple ways such as the SNELL certification, which comes at a higher price as those tests are expensive and the manufacturer had to take the time and research to create the helmet to pass the tests. It is important to remember that each helmets model and brand has its own distinctive way of fitting. Therefore, it is not as simple as ordering a helmet online and using it no matter how it fits. Once you have found a helmet that passes or the safety tests, you need to measure your head and the shape of it to ensure you’re getting the best possible fit. To measure your head, ask a friend to help you with a soft tape measure and measure around the biggest part of your head, which would usually be about an inch above your eyebrows. Be sure to check the size according to the specific helmets as manufacturers don’t provide the same size for all helmets. In some cases, your size might be a medium while in others it might be large. Once you have the right size, you need to consider the show of your head as this will ensure a secure fit, which is important as you wouldn’t want too much space around your head. Once again, you can ask a friend to look at your head from above to determine the shape. Most are oval heads, meaning your head is longer back to front than it is side to side. Once you have these measurements, you can head over to the bike shop and try a few helmets on. The dealer would also be able to assist with sizing and give you more tips on how it should fit. Be sure to purchase a helmet with better ratings and one that doesn’t fit too tight, but also can’t slide around.